The most popular coupling in the USA. 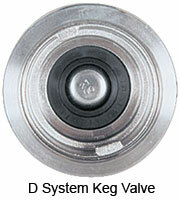 Commercial D-Style Sanke Tap, also called a Coupler, has a lock down mechanism that gives solid click when engaged. Heavy duty construction is designed to withstand commercial usage. Beer is dispensed out of the top port, the side port is for gas. Please Note: This Sanke Tap does not have a Pressure Relief Valve.